The paradox created by the National Investigating Agency on the eve of the bail application of the Malegaon bomb blast accused Sadhvi Pragya Singh Thakur is beyond any reasonable and legal explanation. It’s another matter that her bail application by the special NIA court was subsequently rejected. 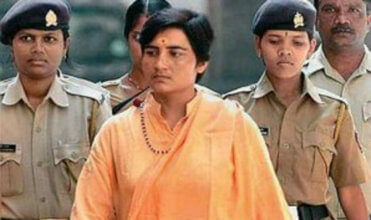 Sadhvi Pragya who is in custody since last eight years had sought bail on the basis of the charge sheet filed by N.I.A. It may be recalled that N.I.A. in its charge sheet field on May 13, had given a clean chit to Sadhvi Pragya along with five others citing the lack of evidence against her. The NIA while filing the reply in response to Sadhvi’s bail plea had given no objection. Strangely enough, the N.I.A. has given the clean chit to Sadhvi when Sadhvi herself has not gone for quashing of the FIR u/s 484 of CRPC in the High Court. It is like Muddai Sust and Gawah Chust [which means that the complainant is lazy or silent and the witness is active and agile]. After filing of the charge sheet the supplementary charge sheet can be filed when some absconding accused is arrested and the fresh facts and circumstances emerge in the course of the investigation. It is not the case of filing the supplementary charge sheet. The NIA has filed the charge sheet which contradicts the contents of the charge sheet filed by the ATS against all the accused including the Sadhvi Pragya. Ms Rohini Salien former public prosecutor rightly said that giving the Sadhvi Pragya a clean chit and recommending dropping of MCOCA charges was not in the province of the NIA’s probe. To her recommending at this stage even before charges are framed to drop MCOCA charges amounts to interference in the Court proceedings. Stretching its brief beyond it’s Jurisdiction NIA can well attract the contempt proceedings. The interveners can well initiate the contempt proceedings against the NIA for going beyond its brief. The Court can also take some remedial measures to this effect. Reacting to the NIA crossing the limits the Congress has come down heavily on the role of the National Investigation Agency in the Court proceedings to save Sadhvi Pragya. The Congress even sought an explanation from those in the corridors of power in Delhi to know who is in their government “Manipulative hand” and responsible for the miscarriage of Justice. The Congress spokesperson said that the earlier investigation done by the Maharashtra ATS under the late Hemant Karkare were rubbished by NIA and described as “dubious” and “questionable”. The late Hemant Karkare an officer of impeccable integrity has cracked the role of the alleged Saffron terrorist for the first time. Before the cracking of Karkare, the role of Sadhvi Pragya and other co-accused only Muslims were in the dock for the blasts in which victims were Muslims. The reason advanced for Muslims turning terror on their community was to create the riots in the country which is nothing but the bunch of lies and far from convincing. Are the Muslims living in the fools paradise to invite their own disaster by such stupid and mad actions. The Muslims in the country are on the weakest turf politically, economically and socially whose dignified survival is threatened every other day on one pretext or the other. They are promised the moon only on the eve of an election. Otherwise, all through there remains the political honeymoon between the different political parties and the communal forces out to damage the secular fabric of the country. The community suffers victimisation due to the prejudice operating at the different levels of government. However, all can’t be tarred by the same brush. However the fact also remains that a large share of the population is not against the largest minority and crave for the rights and Justice. Gujarat is an example where non-Muslims have not only disapproved of the alleged genocide but stoutly supported the victim Zakia Jafri. It is relevant to quote Ram Punyani, an eminent analyst on Hindu-Muslim relations who is quoted to have said that Muslim communalism is too weak to offer any threat. Muslims in India cannot even think of having the luxury of riots for the reasons best known. It is the political class which thrives on fomenting the communal clashes which helps it electorally. The present outrageous and incendiary scenario is too well known to need any recounting. Some of the Muslims might have been allegedly involved in the terror cases like their counterparts. These are the misguided and misled youth constituting an aberration. The terrorists should face the maximum punishment but there is no justification to set afloat the fictitious stories to implicate the Muslim in the false terror cases. It is to create the fear psychosis in the community to lower its morale and overwhelmingly marginalise it to silence its voice against any injustice done to it. It is easy to implement the hidden agenda no more hidden with the muzzling of the dissent. In the context, the former public prosecutor Rohini Salien’s statement is no less significant when she alleged that she was approached by an NIA officer in June 2014 after the NDA government took charge at the Centre with a request to “go soft” on the accused including the Sadhvi Pragya and Col. Prasad Rohit. The alleged intervention by the NIA in the said case to influence the outcome and other related fictitious stories set afloat not coming up to the subsequent judicial scrutiny makes one feel that whether NIA itself needs the clean chit? The Kaiser’s wife should be above suspicion. However notwithstanding the not comfortable track record of some of the investigation, the credit goes to late Hemant Karkare to expose the other side in the Malegaon blast. Karkare’s exposure triggered the allegation that there was the coercive collection of evidence. What is the logic in the allegation of forcing the alleged Saffron terrorists in giving the evidence? Where is the evidence to suggest that the alleged Saffron terrorists were forced into giving evidence? The falsehood herein cannot be sustained. Karkare exposed the other side in the Malegaon blast and he was bumped off in the mysterious circumstances. A.R. Antulay, once the golden lad of Congress raised the issue of Karkare’s death in parliament and he had to pay the price of his political death. He went into oblivion thanks to his own party disowning him. The situation culminated into an extent that Antulay’s funeral was not even attended by the bigwigs of his own party. In the circumstances instead of throwing muck at the sincerity of late Hemant Karkare in the Malegaon blast investigation, there is the need to strengthen the resolve to effectively combat the terror of whatever colour it may have. Any attempt to compartmentalise terror is not in the national interests. What is important is the prevalence of Rule Of Law and any attempt to undermine the Rule Of Law with the unjustified intervention is a myopic approach towards terror which is a blatant departure from the cause of Justice. Justice along the sectarian lines would only breed insecurities harmful to the larger national interest. The national interest should occupy primacy over other interests.